At Knit's End by Stephanie Pearl -McPhee. 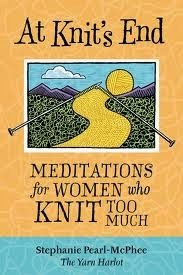 As a fellow knitter and having become quite addicted, I can relate to so many things she says about being an avid knitter. However, there are some things I can only marvel at and others that make me feel glad that I now know that I'm not the only one who thinks or does whatever she has described. So if you ever doubt that what you are writing might not be worth the effort, I would suggest that you think of your potential readership and all the the shared gems and joys your writing may bring.